Another glitch with the Kingdom's League, this one with the rewards. 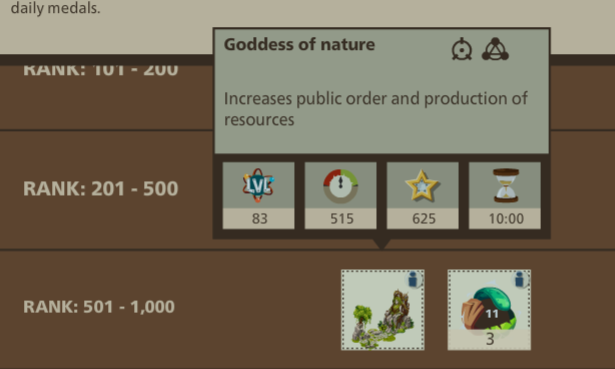 In the rewards menu in rankings, it shows that I should currently be at the level of a 515 P.O. Goddess and 3 tier 11 catalysts, but outside under "Current Rewards" it shows one at 480 P.0. and two catalysts, which is the tier below me. minor issue, in kingdom's league info tab> Kingdom's league rewards> season end rewards: one time ranking is misspelled as 'tanking'- I do play a tank game, but i'm pretty sure that this is a mistype, as 'R' is next to 'T'. The intention of this thread is to help you, the players, by answering questions, having discussions and also verifying potential bugs or problems you may be experiencing. I will communicate relevant information directly to you guys as and when I receive the information myself via this thread. This thread is intended for English-speaking players, however if you want to post your problem here in English from another server, that is no problem at all! 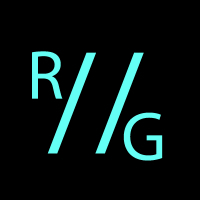 I want you guys to feel like you can discuss freely about Empire in this thread, however, this thread will not tolerate abuse towards other players/forum users nor towards Goodgame Studios employees and moderators. Should there be any abuse of this kind seen in this thread, the user responsible should be prepared for a possible ban on their account. Apart from that, have fun! Enjoy Empire! And get in touch if I can be of help to you! So i just made a new account named Noach because i thought my original account was deleted since i wasn't active for a long time. I bought 15 dollar worth of rubbies + 10 dollar for calling. After that i got a mission, i needed to sign in with facebook... Then i got a message that that account was already in use. 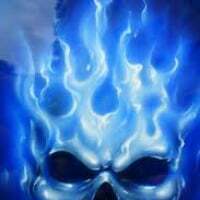 Next time i clicked login with facebook i got back my original account.. I tried to went back on my new account i bought 15 dollar worth of rubies on but couldn't login. 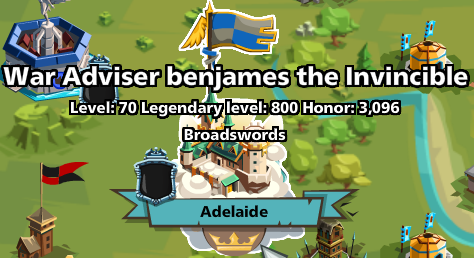 When i searched up my name on my original account i saw another players castle.. Maybe its on another server but i don't think so... I Want to get my money refunded because it's all gone. The Berimond watchtowers are changing setup. I spy on the watchtower and then send an attack right after but between that period of time, the tower has changed to a different setup. I'm having a problem with Ice Championship reward points as in they have not changed since the bc started. I am still at the start of page 19 and have hit at least 10 bc and defeated them all. Did this problem continue or did it turn out to be a lag? If it didn't resolve itself or reward you correctly I will investigate this further. why is the gallantry rankings not working i have dropped a level and lost my loot bonus cant see a reason if i am in top 100 and everyone looses 7 % and i have over the 95 k mark how do i drop out of top 100 and it shows i have more than enough for the title ? I am not sure if I am understanding the issue, I checked your account and yes it appears you dropped a title, the more people compete and gain points then the more they are going to advance, it just appears this time you were unlucky and dropped out of the top 100? If I have got this wrong, feel free to send me a direct message with as many details as possible so I can check this with better understanding. What is the issue with your shapshifters? I will try to help as best I can! Payout timer in the kingdom League doesn't roll over to 24hrs once it reaches zero. It just reads zero until you logout and back in again, at which point it reads what it should. Using Chrome. @Rainbow Brite Hate to tell you this, but it would appear that you should monitor this 24/7 and make what we report a priority since there are so many bugs, many of which have been around for a long time. GGE should concentrate on qualtiy of updates, not quantity. I know it's not your fault, but maybe you should show the powers that be the bug list. We as users should not be able to find a bug in every update in less than 24hrs(I'm being generous on 24hrs). Very bad Quality Control. Just tried to reproduce this problem and can't seem to get the same problem, is this still going on for you? I understand your frustration but player posts on forums cannot be monitored 24/7 as I am sure you understand. Bugs are frustrating, and I agree that the quality of the product is of the up-most importance. I assure you the QA department is doing everything in their capability to catch everything during the testing phase, but sometimes due to the scope of the game, unfortunately things do slip through onto the live product. If bugs appear, the first point of call is the customer service department, then the patterns/volumes/severity of complaints and issues can be identified and put forward to us for further investigation. On the forums however, this level of bug compilation unfortunately just cannot be done. The text which is meant to correlate with the new Kingdoms Leauge on the BC page seems to be overlapping. It's not the biggest deal for usability but others in my alliance have mentioned that it bothered them. This issue should be fixed with the next update, thanks for the polite message! Whenever I go to my bookmarks menu, this is all that stays that. I left it there for an hour, and it didn't change. Just had a peek into your account and cannot see this issue anymore, was it a cache issue in the end or does it happen randomly? @Rainbow Brite shapeshifters Insignia shop not resetting - shows goddess of nature sold out - bought 1 2 events ago but still not available ? I am going to take a look at this right now! Bear with me. new SS event today and still showing sold out - any info? 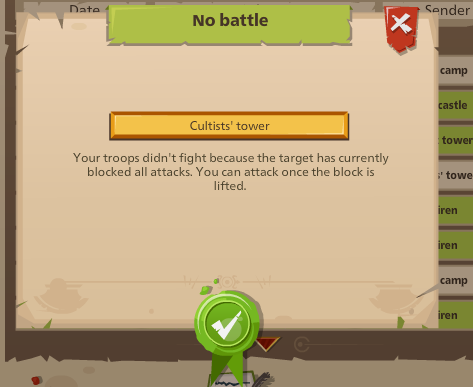 I have had a few cultist towers return no battle, even when I have not hit one all day. I hit another tower with no problems. This has happened a few times before, a couple of times I have missed the daily tasks because I have launched one attack before logging off and failed to complete the task due to no battle. whats up with the lag,, us1.. 2-5 second lag on every click last two days. 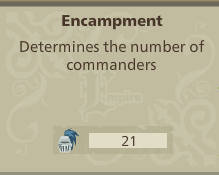 Encampment lvl 7, 21 comms. third event since i bought one still showing sold out - and no castellian set yet ? 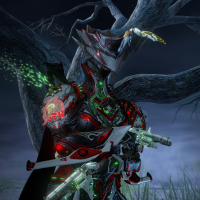 So, it turns out the bug is in the tooltip, this deco and EQ sets will not be available ever again, it's the tooltip telling you they will be that is the bug. I understand the annoyance from this issue, trust me! It seems like once I exile dethrone an FL, it wont hold its spy report. They tend to disappear 5-10 mins after being spied. Its only happening to FLs that I've dethroned. As far as I can tell, the FL doesnt actually respawn.